Free pouring latte art is what we love to do at the caffe, and while regular milk work the best in creating latte art, we also do it with other types of dairy, and soy milk. Steaming soy milk can be tricky, but we’re having fun with it. 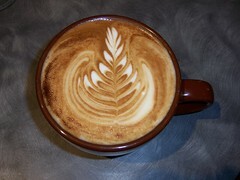 The art below is free poured with soy milk by Yiching.